Zen Empowerments. Over 2000 Advanced Energy Workshops for Physical and Spiritual Evolution. Zen Empowerments Workshop presents special transmissions of new energetic vibrations that will help you radiate Loving Kindness & experience self actualization to transcend your self created illusions! The material world is not the true reality as you will learn to experience the vastness of a Quantum Reality where all things already exist as probabilities! Your Life will Be Blessed! 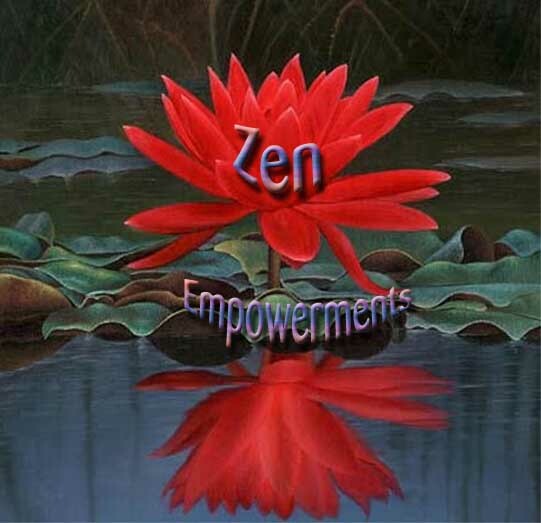 Zen Empowerments energies will help you to remove incorrect or any negative expectations or preconceptions. Through Zen Empowerments Workshop, you will ultimately discover Zen (nirvana) for yourself. Zen Empowerments Workshop will help you discover your true nature by direct experience! The Buddha said: "that nothing whatsoever should be clung to." Zen Empowerments Workshop frees your mind so dispassion is turned to equanimity. You are made up of minute indivisible particles of energy & light that arises and pass away in every moment of your life. Our minds and emotions are constantly changing. Is there any point in clinging to that which is so changing? As you learn to spiritualize your consciousness, ultimate truth will replace your changing thoughts. You will receive the correct Zen Empowerments Manual via Email, All Empowerments, Printed certificate, Protection Talisman. Plus full email support is given before, during and after all my Workshops.